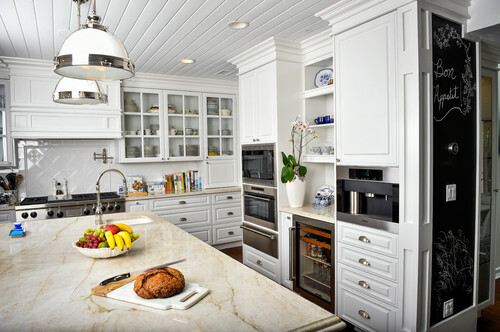 Kitchens play an important role in every home, giving the home its health and happiness. 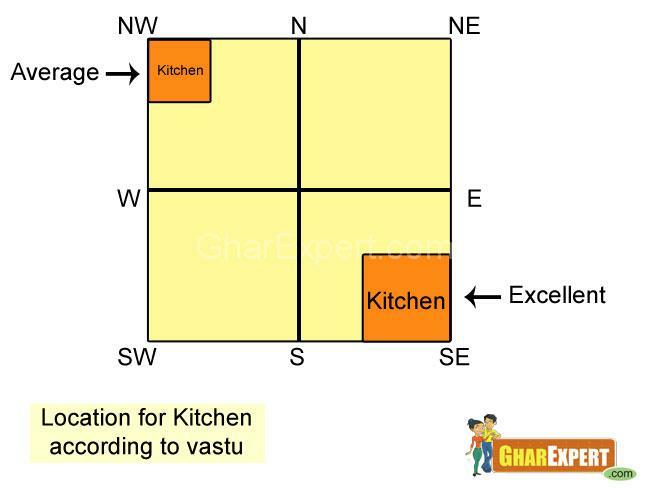 People in India, consider Vaastu an essential guide in designing their kitchens, to lend balance and harmony to the space. Vaastu is a science that details certain essential steps which when taken into consideration, enhance the aura of a kitchen. It has been proved that by the strategic placement of different appliances and designated cooking and storage areas, there is a harmonious flow of energy that directly impacts the food that is prepared, as well as the health of the people eating it. Many decades ago, cooking was done on wood-fired stoves in the courtyard and utensils washed in a separate area of the home. Vaastu guidelines were formulated based on the position of the Sun and wind directions. 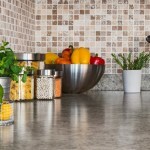 This practice is followed by many even in today’s modular kitchens, with the cooking space being compact and efficient, yet without compromise on the food and its cooking process. Kitchen Vaastu gives insights into many aspects; the part of the house the kitchen is located in, the direction that it faces, doors and window placements, areas where gadgets and appliances can be placed, including where the gas cylinder, refrigerator and sink should be located. Our decor expert at HomeLane gives insights into different Vaastu Guidelines and also explains the scientific reasoning behind each of them. These can be interpreted and used as per your discretion in the kitchen. 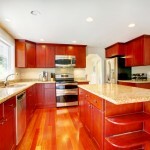 * SOUTHEAST or NORTHWEST are considered the best locations to set up your home kitchen. When cooking was done on woodfired stoves earlier, these corners were most preferred since hot winds, blowing from S-W to N-E direction, could not cause damage to the house by fire. The South-East corner is also considered the best since the element of fire governs this direction. * Avoid the NORTHEAST location for your kitchen. With the early morning sun entering the home from North and East direction, a living room which opens out into other rooms is an ideal option. Placing a kitchen there is considered a waste of the space. * Doors to the kitchen should be placed in the NORTH, EAST or NORTH-EAST DIRECTION. Since South-East is considered an ideal location for the kitchen, in an L-shaped layout, if the countertops are positioned along these two walls, the entrance can only be made from the North or West direction. * Kitchen doors should open clockwise. This helps the majority of the population, which is right-handed. * Main kitchen windows should face the East. With early morning sunlight considered beneficial to health and UV rays sanitizing the cooking space, it is thought that East facing windows allow the flow of light and help rid the kitchen of odours, germs and dispels darkness. This sunlight is also good for the homeowners who may not go outside to soak it in. * Smaller kitchen windows can be placed in the South. Besides providing additional ventilation, these windows also help in cross-ventilation, especially since the kitchen produces plenty of odours and cooking fumes that can be replaced by fresh air. * Cooking Hob should be placed in the SOUTHEAST CORNER of the kitchen. Since an L-shaped layout, in general, occupies the two adjacent walls, it is natural to place the main kitchen appliance i.e hob there, while the rest of the countertop space can be used for cooking and preparation. * Cooking should be done facing the East. With women spending their entire day in the kitchen and losing out on sun exposure and Vitamin D, this direction was thought to be ideal to soak up the beneficial rays of the sun. 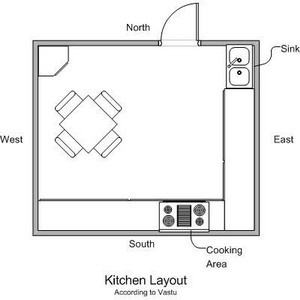 * Kitchen sink should be placed in the Northeast kitchen corner. Earlier, when there was no availability of running water, and water stood exposed in large containers, it was believed that placing it there exposed the water to the UV rays of the sun, which killed germs and kept the water purified. * Cooking Hob and Sink shouldn’t be placed together. The general belief is that fire and water are two opposing forces and do not work together. * Kitchen sinks shouldn’t be kept at the junction of two counters. Having the sink in this position makes it uncomfortable for the user. Water should also never be allowed to leak or go to waste. 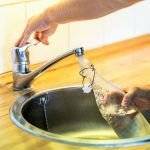 * Water filters should be placed in the NORTHEAST portion of the kitchen. The N-E side is where the rays of the sun come in first, and exposing water to them will ensure it gets sterilized and purified for consumption. * Refrigerators should be placed in the SOUTHWEST or NORTHWEST kitchen corner. With kitchen counter-tops being fixed in the South-East walls, appliances like ovens and fridges can only be placed in available spaces such as S-W or N-W corners. * Microwave ovens must be placed in the South-East corner. As with the stove, microwaves are also used to cook food and can be placed within that area. * Exhaust fans in the EAST walls– With the cooking stove and oven kept in the S-E corner, it is a given that the exhaust fan or chimney should be placed in the opposite or East direction. * Storage above the hob/ stove should be avoided. Space above the stove is either left open or fitted with a chimney to remove odours and fumes. Placing a cabinet there will prevent these from dissipating as well as act as a fire hazard. Vaastu believes that every colour justifies a specific purpose, and colours in the kitchen should be chosen intelligently and carefully. * White colours soak up the natural rays of the sun and reflect it, creating brightness and a positive vibe. White has been associated with purity and a good colour to begin the day. * Warm colours like yellows, reds and orange stimulate appetite and create a cosy environment. * Light and pastel colours such as orange, soft pink, icy blue and green make the food appear attractive. They change the way the food is perceived. The science of Vaastu is based on age-old concepts and practical applicability. 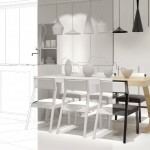 It can be adapted to suit modern kitchens and homes. Kitchens at HomeLane have been designed keeping in mind these timeless concepts and can be tailored to suit any kind of home.